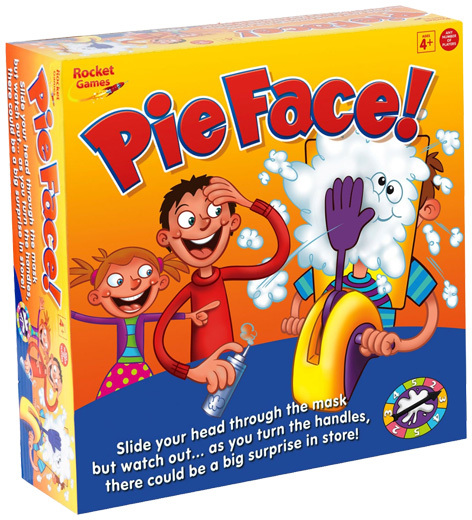 As probably one of the best slapstick games of the 21st century, Pie Face went mainstream when Hasbro acquired the licence from Rocket Games to manufacture and distribute the game throughout the US and Europe. Easy to play, Pie Face comprises of a mask and spring loaded arm containing a large scoop of whipped cream! A separate spinner indicates the number of times that the tension on the arm is increased. When it gets to a certain point – splat - the player at the time gets a face full of creamy mess! As a means of creating laughter and hilarity between families or groups of friends, Pie Face has no equal. Hasbro are well known for their huge portfolio of family, party and preschool games, and Pie Face joins the likes of Jenga, KerPlunk, Buckaroo and Operation on the list of all-time best sellers. Please tell us what you think of Pie Face by Hasbro.